Emmy-nominated Padma Lakshmi is internationally known as a food expert, model, actress and bestselling author, as well as the recipient of the 2016 NECO Ellis Island Medal of Honor and Variety’s 2018 Karma award. Lakshmi serves as host and an executive producer of Bravo’s Emmy award-winning Top Chef, which is currently in its 16th season. Lakshmi established herself as a food expert early in her career, having hosted two successful cooking shows and writing the best-selling Easy Exotic, which won the “Best First Book” award at the 1999 Gourmand World Cookbook Awards. Lakshmi followed this success with the publication of her second cookbook, Tangy, Tart, Hot & Sweet. In 2016, she released her food memoir, The New York Times bestselling Love, Loss and What We Ate, which also won “Best Lifestyle, Body & Soul” at the 2017 Gourmand World Cookbook Awards, followed by The Encyclopedia of Spices & Herbs. I agree to judge the Piglet solely because I am flattered just to be asked. When I sign up for this back in January, I don’t realize I am being enlisted to pick the winner. You know, the winner, winner. Of. It. All. I can’t believe I got myself into this. What was I thinking? I mean, I’m used to being judge-y, but on my show, Top Chef, there are four of us to share the blame! I’ve heard horror stories of other judges being virtually stoned to death in the comment sections for their part in this Food52 madness. I am seriously upset with Amanda Hesser right now. The two books arrived seven days ago. 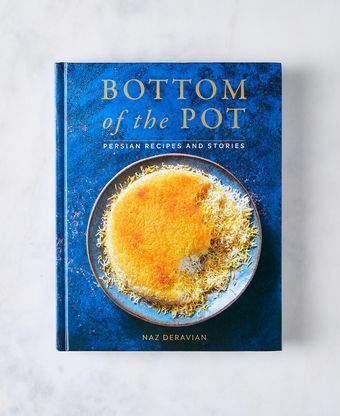 I take each of them out of their package slowly, like a child on Christmas opening her only gift, and cast my eyes on what are two glorious love letters to food and heritage: Bottom of the Pot by Naz Deravian, and Season by Nik Sharma. The next day, my assistant, Anthony and I get a “friendly” email from Food52's Books Editor, Brinda Ayer, a name I know is from my part of the world. She cheekily says she owns both books and doesn’t envy me. Thanks, Brin. Anthony informs me that the verdict is due next Monday. Today is Wednesday. I don’t have much time with the books: To thumb through the pages leisurely, peruse the pictures slowly, take stock of all the ingredients required, browse the indices; to read them cover to cover with my usual steaming mug of Hediard Rose tea by my side. I begin to cross the ocean of work, meetings, writing assignments, Top Chef finale, and various dinners I have in front of me, before I can even crack them open. All the while, they sit, taunting me, on the edge of my desk. I cannot wait any longer. I love cookbooks, always have, long before I ever thought of writing them. Since college, I have bought and hoarded cookbooks, and today I have a separate library just for them. I savor them slowly, and imagine the author by my side at the stove. I like to live with new cookbooks, sit on the couch with them on my lap for days, place stickies on all the things I will make for future soirées and dinner parties. Sleep with them splayed open, page-side down, next to me in bed for a few nights. Yes—I am someone who sleeps with books next to her head. My first cookbook as an adult was the Craig Claiborne New York Times International Cookbook. That same greasy, dog-eared copy continues to transport me to a new distant land with every chapter, again and again. That’s the biggest reason why I love cookbooks: They open new worlds to us, and ones we may not experience otherwise. They’re a less costly way to travel, allowing us to learn about a place and culture with our forks. They give us an escape and an education. Like I said, right away I know that this competition is going to be a close clash of the Titans. How am I to compare two such beautiful, and beautifully different, pieces of culinaria? What strikes me immediately is that both these books are written by first-time authors. I would have killed to have written either of them, even now as a fifth-time author. Another full disclosure: I have always admired Persian cuisine and culture, which I think I'll find in Bottom of the Pot. In fact, my not-so-subtle crush on Andy Baraghani of Bon Appétit magazine is not wholly, but mostly due to this admiration. I am also knee-deep in Shahnameh, by the poet Ferdowsi, so I am in the zone, dreaming of silk robes and the perfect tahdig, wanting to do whatever it takes to be more like a Persian king. I immediately and ill-advisedly cease all work, neglect all email correspondence, cancel all meetings. I don’t even shower after the gym on Wednesday, but head straight for my couch, pull my favorite blankie up to my poitrine, and settle in for a cozy afternoon by the fire with these two books. I start with the prologues and introductions. All good food is narrative, and to me the narrative in cookbooks must be good, too. Right away, I’m drawn to Naz Deravian’s writing. I feel I am reading a memoir filled with love and nostalgia, as much as an introduction to one of the world’s most beautiful cuisines, spiced up with her family’s nomadic winding through Italy, Canada, and finally, Los Angeles. It reminds me of the ethereal cookbooks by Greek–Cypriot food-and travel-writer, Tessa Kiros. Naz’s admiration for her family and her roots is palpable in every word. Even her description of the '70s building corridor she walks down to enter her home is at once so lyrical and literal, I feel I am right there with her. When she arrives home, she finds her husband inverting a pot of rice, and I can smell the scent of steaming rice and saffron in the air. What a lucky man Mr. Naz must be. How well their children must eat. I am so charmed, I long to be a part of this family. “Is a woman in her forties too old to be adopted?” I wonder. Then, I read Nik Sharma’s introduction. I appreciate not only his journey from scientific research to professional food writing and cooking, but also the clean, direct prose with which he tells his story. I am taken by his yearning to be accepted as an openly gay Indian man, and I cheer inside when his mother does accept her son for who he is. I am temporarily distracted by the absolutely gorgeous photography, all taken by Nik himself. The photos have warmth and depth. They pull you into his world. They depict reportage scenes I instantly recognize from home. I am taken back to the street-food vendors of my childhood, watching the chaat wallas in New Delhi’s Bengali Market deftly pierce eggshell-delicate pani puris with their thumb. And I can feel this kind of movement in Nik’s hands, even though I only see still photos in his book; I feel I already know his mannerisms intimately. Nik’s hands contain a multitude. I wish I could actually stand in his kitchen and watch him work. In terms of setting up home cooks for success, both cookbooks do a fine job of explaining spices, as well as lesser-known ingredients and methods. But while it is a pleasure to read Bottom of the Pot, the print on the page is faint and a bit more tiring to read than Season, which has print that is darker and bolder. This is a shame and does a disservice to Naz’s prose. Yes, this sort of minutiae is what it’s come to. First, we make dessert. From Season, the Upside-Down Orange and Fennel Cornmeal Cake. I’m immediately drawn to how beautiful this cake looks in the book, and the fact that it doesn’t have any frosting is a plus. This recipe appears quite straightforward and easy, and turns out it is. In the beauty shot adjacent to this recipe, Nik’s cake apparently has some negative space between the orange rings on top, but in his process photos, he completely canvasses the bottom of the pan before pouring in the batter, overlapping the rings of citrus until it looks like a fruit version of scalloped potatoes. I decide to cut my rings in half because they are quite large, wondering aloud where Nik found such tiny blood oranges. A true mystery. When I add the zest to the batter, the whole house smells of oranges and neroli. It’s heaven. The cake comes out beautifully and I let it cool, posing all around the kitchen for selfies with it. I take a healthy slice and savor it at teatime with a hot mug of Wagh Bakri cardamom tea. I love that the cake is not too sweet. The use of whole fennel seeds is genius, and the slightly bitter rind of blood orange gives it a grown-up edge. It looks glorious under a glass cloche on the counter, making all who pass slow down as they walk by. From Bottom of the Pot I pick the Roulette Cake, a basic sponge cake stuffed and rolled with rose water-scented whipped cream, and strewn with strawberries, pistachios, and crushed rose petals. I am so excited to make this dessert. It seems a more sophisticated version of strawberry shortcake, which is always my go-to choice for birthdays, an end-of-summer treat I look forward to every year. The fact that it has rose scented-whipped cream makes me swoon. Having grown up refusing to drink milk unless it had a glug of Rooh-Afza syrup stirred in, the commingling of rose and dairy speaks to my eight-year-old self. While this looks more fiddly to make than the orange cake, I take a deep breath and follow the directions. So far, so good. I stand by the oven, watching the cake rise the whole twelve minutes it’s in there, and with every passing minute I get increasingly anxious about rolling this cake. I am sure it’s going to break. I call back in my assistant, Anthony, and he marches into the kitchen like a Navy Seal. He is calm. He is methodical. He peeks over my shoulder at the instructions. He smiles at my agitation because—well, sometimes it’s just nice to see the boss sweat. He rolls and chills, unrolls and fills, chills again. We are both very proud of our cake baby. Later, he tells me that he has never made a roulade before. Both cakes are winners. How do I compare them? I can’t. I suppose the orange fennel cake is more interesting, but the roulette cake is so light and airy—feminine, even—with its crushed rose petals and cream. I decide the orange cake will be great for tea and breakfast with some yogurt, and the roulette cake will be amazing for dessert and a midnight snack. I cannot stop slyly dragging my finger across the roulette cake’s whipped-cream flanks every time I open the fridge. Still, no verdict or clear frontrunner. Next up, chicken. I make Season’s Curry Leaf Popcorn Chicken, except I let the chicken marinate in the spiced buttermilk for two days in the fridge, instead of one, as instructed; I can no longer neglect the rest of my life. I taste the marinade before adding the chicken, curious as to how the 13 different ingredients in Nik’s recipe would play off of one another. To my delight, the combination is like a right hook from Muhammad Ali, packing a total punch of flavor and singing together in beautiful harmony: The sourness of the buttermilk; the heat from the serranos and cayenne; the bite from the ginger; the grassy notes of the curry leaves; and the fragrant, earthy blending of cardamom, cumin, and coriander. These flavors are, of course, all very familiar to me, ever-present throughout Indian cuisine, but I have never seen them used in this type of application. I could have stopped there and just enjoyed the lassi. Despite sitting in the marinade for two days, I am disappointed that the bold flavors don’t sing out quite as loudly once the chicken is cooked. Their presence in the cooked chicken is like a faint whisper I’m straining to hear from the next room. I also try Nik’s Hot Green Chutney-Roasted Chicken. A green chile chutney gets stuffed under the skin of the bird, promising to impart flavor into the meat as it cooks. And I massage the skin of the bird with it, too. Nik’s take on chutney is interesting—he uses a combination of arugula and kale for its green base. I think the chicken was tasty, but again it lost flavor during the cooking process. All the green cooked out, and the kale became increasingly bitter as it broke down from the heat. Next time I make this dish, I will omit the kale from the chutney, as I felt it diluted the chile’s heat and took away from how flavorful the chutney could’ve been. I will also roast the chicken without the chutney, and just use it as a sauce. My go at Naz’s Tahcheen-e Morgh, a layered saffron rice dish with chicken, starts with washing the rice no fewer than ten times to remove all of the starch, instead of the five the recipe assures me would be sufficient. I am used to washing basmati rice, so this does not faze me. The directions then say to cut the chicken thighs in half, and I’m not sure if she meant lengthwise or widthwise (I ended up slicing widthwise). Since we eventually cut the chicken into bite size pieces, once it’s cooked, I think it would have been better to do this from the get-go. This would have also reduced the overall cooking time of the dish. By now, I don’t have a clean glass baking dish large enough for all the rice and chicken (there was a lot going on in the kitchen), so use a metal one, which the recipe’s headnote said was fine. The top layer of rice, while a beautiful golden brown color, sticks to the pan as I flipped it to turn out the rice, and my tahcheen separates. I’m able to pastiche it back together, à la Julia Child, and find it to be quite tasty and fragrant. I’m also eager to try Naz’s Khoresh Bademjan, or eggplant stew with chicken drumsticks, intrigued by her promise that it would leave you lingering at the table, continuously “picking at another piece of eggplant.” Here, eggplant is bathed in a jammy tomato sauce, complete with warm notes of cinnamon and saffron, and the dish is flavorful and perfect for the rainy Thursday on which it was made. The recipe says to cut the eggplant in half lengthwise and roast them in the oven, and finally add them to the sauce towards the end of the cooking process. The halved eggplants, turned down, look like dark sea cucumbers swimming in the gravy. I think they would have been more appealing (at least, to the eye) if they were cut into more manageable chunks instead. Season’s Toasted Cumin and Lime Cucumber Salad, which I make next, looks like a familiar Indian kachumber, or cucumber and tomato salad. While tasty, it leaves the people I share it with asking, “Where’s the rest?” I feel it is very cumin-forward (and I am accustomed to a lot of cumin) and has a serious spiky heat, due to the Thai green chiles. I’m not sure one could eat a whole salad bowl portion of it. The recipe says to deseed and mince the chiles, but Nik’s cover photo shows them sliced in rings, and that is indeed what you see as well in the interior of the book. Not a big deal, except they’re supposed to be green Thai chiles, which are tongue-searingly hot. The dish, while super easy to make, ends up feeling more like a relish than a complete salad. Indeed, in Indian cuisine, kachumbers are typically served as accompaniments with the meal rather than alone as first courses. Perhaps this recipe would have been better served if listed as a quick relish among the condiments and chutneys in the back of the book. As a relish, though, it packs a good wallop of hot, herbaceous heat. I think about how it would be so great heaped on tacos, instead of the usual pico de gallo. I fantasize about eating a nicely charred Bombay pomfret, slathered with tamarind and folded into a paratha taco or kati roll, and topped with nothing else but this cold cucumber and cumin relish. I am salivating now. I’m unable to eat the cucumber dish alone, but I want to eat Naz’s Roasted Squash and Grapes as a meal all by itself. Each roasted grape I try is like a tiny flavor bomb against the charred, subtly sweet butternut squash, all swimming in a tangy sauce of pomegranate molasses, maple syrup, and butter. And I love that you wait until the end to add in caramelized red onion (which was cooked separately from the squash and grapes, so as not to lose its concentrated allium flavor), along with fresh mint. I save the last little bites of leftovers, just ¼ cup, knowing I would enjoy it immensely the next morning, on a slice of toasted sourdough smeared with a little goat cheese. I always appreciate recipes that allow room for repurposing. Season’s Deviled Eggs intrigue me because of the addition of tahini and za’atar, one of my favorite spice blends. I’m curious as to how these flavors would translate into deviled eggs, and the result does not disappoint. The tahini gives a nice nuttiness to the base, while the za’atar cuts through the richness with a pleasant tang. I’ve garnished my deviled eggs with za’atar before, but why have I never thought to add tahini to the yolks? What a revelation. The next day, I gobble up the leftover deviled eggs with the squash and grapes on that sourdough after all, and even save the leftover deviled egg filling to spread on toast very late that night. I decide that Nik’s deviled eggs with Naz’s roasted squash is a meal of sublime perfection. Again, why do I have to choose? Can’t they both win? They’ve certainly both won in my heart and household. I compare Nik’s deviled eggs to the Smooshed Potato and Egg over lavash flatbread from Bottom of the Pot, which I find to be sadly lacking in flavor. The recipe says to boil a potato, mash it once cooked through, and layer it on top of the flatbread. Then, drizzle the flatbread with olive oil and a sprinkle of salt, top with a soft-boiled egg, and garnish with dried herbs. I feel that there was a missed opportunity to build more flavor into the dish earlier in the process: I would have personally preferred to toast the lavash and dress it with a little olive oil and herbs first; dress the mashed potato with more herbs, salt, and olive oil before putting it on the flatbread; and then topping the seasoned potato-slathered flatbread with the egg and more herbs. I know this recipe is supposed to be a quick weeknight breakfast-for-dinner thing, but Naz’s other dishes have so much flavor, this seems bland and out of step in comparison. So, all in all, I try five dishes from each book. My little person wanders into the kitchen, asking who’s coming to supper. I know that ultimately, she is trying to do the math on how much cake she can get away with for herself. Indeed, the house does feel like we’d had two back-to-back dinner parties. I light some candles. Such is the marathon eating life of a food professional. I come home Friday night after dinner out. (Yes, I have the nerve to still go out to dinner after all of this cooking and tasting has transpired.) I think long and hard as I drum my fingers on the edge of my keyboard, knowing I need to decide tonight. These two books are exquisite, well thought out, and enticing. Any kitchen or cookbook library would be blessed to have them. Like much else in life, neither is perfect, but both promise and deliver so much joy to this writer’s household. In the end, leaving aside all the dreamy prose, the sumptuous photography, and the rare ingredients, the recipes are what matter. How well do they work, both on their own and relative to each other? Which book’s recipes would you make again, exactly as they are written, if you could only choose one to cook from forever? With this in mind, I must give the win to Bottom of the Pot by a hair, just a razor’s edge above Season, for delivering a final product as flavorful and memorable as was promised on the page. But it’s really by just a hair…I’m sorry, Nik—please forgive me, my Desi bhaiya. Thank you for such a wonderful review, Padma! It is thoughtful and well written. I loved all of the detail and descriptions! Thank you, Food52, for another great Piglet! I have had a hard time keeping up because of travel but I loved the Piglet every year. Thank you. Great review, well written. My favorite part is the sharing of the decision making process. Thank you! It's been another delightful and interesting Piglet! Thanks to Food52 for keeping this marvelous tradition going year after year. I begin to look forward to it each January! I must say that my wife got me into the Piglet a couple of years ago. Initially, it was simply a cute name that drew me in. But the last several years, March never comes soon enough. We make predictions, read together and always (ALWAYS) make room for the cookbooks that are the most interesting. In this instance, we had both finalist cookbooks in our library before the event began. While my lovely wife will enjoy the challenge to duplicate the recipe success, I enjoy the fruits of her work. Personally, while I found the contest this year to be uber-professional, I found myself hoping there would be an awful judge or a controversy as in years past. I kind of missed that part of the event - I guess those are the results you get when you have complete commitment from professionals who follow instructions so well! Oh well - maybe next year we'll have something controversial! We can't wait. Thanks for making this happen - it's looked forward to by so many people. Loved the Piglet this year, just as I do every year. I enjoy all the reviews, even the poorly written ones and the ones where the writer doesn’t actually make anything. I love the total subjectivity of it! I hope it keeps going! Loved, loved , loved this review! Padma shared so much of her decisive process. She made dessert first, something that I would do! And she did a very good job of inspiring most of us to want both cookbooks. Thank you Food 52 for another inspiring Piglet! Such a thoughtful review of both books. Fantastic end to the contest. Perfect final round for The Piglet. What a marvelously executed and beautifully written review. And now to plunge into BOTH books! 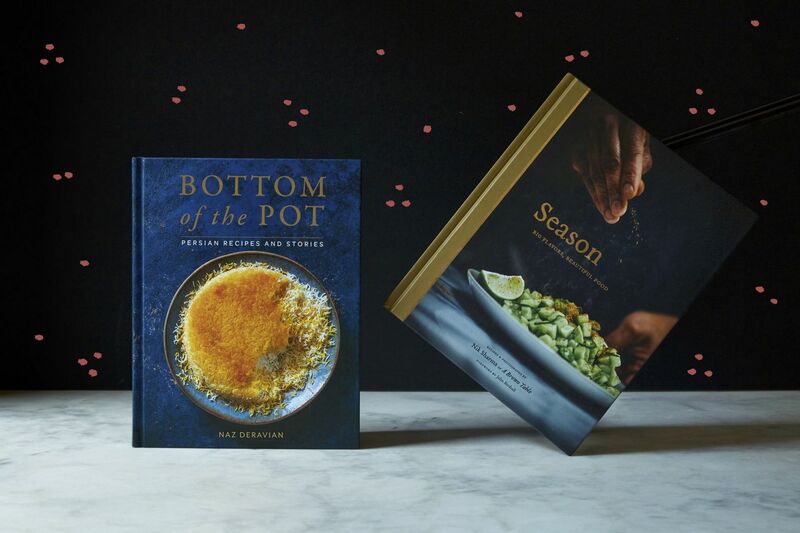 Looking forward to May when Season is the book of the month for our Food52 Cooking group. Now, off to find space on my overstuffed bookshelves for The Bottom of the Pot. Thanks for a great competition and kudos to the reviewers who invested their time to really get close to the books they were judging. I plan to track down Padma's tea mentions. Thanks for such a wonderful review, Padma. I've been rooting for Bottom of the Pot since the beginning, but I'll definitely order both books after this review. I think we can all agree that in her heart, this was a tie. I love this review. I savored every word. I was sitting on the edge of my seat wondering which one would win. Now of course I am going to have to break down and order copies of both books. Sad to see the end of the 2019 piglet though. I always look forward to the piglet each year since I found it. This year has been exceptionally good though. I've loved the reviews and judgements this year. The only one that wasn't a go for me was the video one but in it's way it was not horrible. It just seemed a little off for this older lady. You said all the things I thought about this year. Wow! What a great review! I found myself holding my breath as I was reading close to the end. Two great cookbooks with a grand finale judgement written by Padma Lakshmi. Congrats to Naz Deravian and Bottom of the Pot! Enjoyed this well-written finale from someone who clearly knows more than a thing or two about what makes a good cookbook. I look forward to the Piglet every year and this year did not disappoint. There were new voices in books I would likely never have considered and many thoughtful reviews. Thank-you Food52! Ha. I have Bottom of the Pot and it's great. Piglet underwhelming this year. May be time to phase it out. Were the pageviews sufficient for the time and effort spent? Are you actually suggesting that because you didn't enjoy the Piglet this year, Food52 should stop featuring it? (Eek— we really need an Edit function! )...was underwhelming because she already owned the winning book. Which was great. Had me on the edge of my seat. I was afraid to scroll down too far and accidentally see the winner before finishing the review. Great job Padma!